Mary McCord, Longtime Department Of Justice Lawyer, Is Leaving Her Job In May Acting Assistant Attorney General Mary McCord told staff this week she is leaving to pursue other opportunities. McCord has led the probe into Russian election meddling. 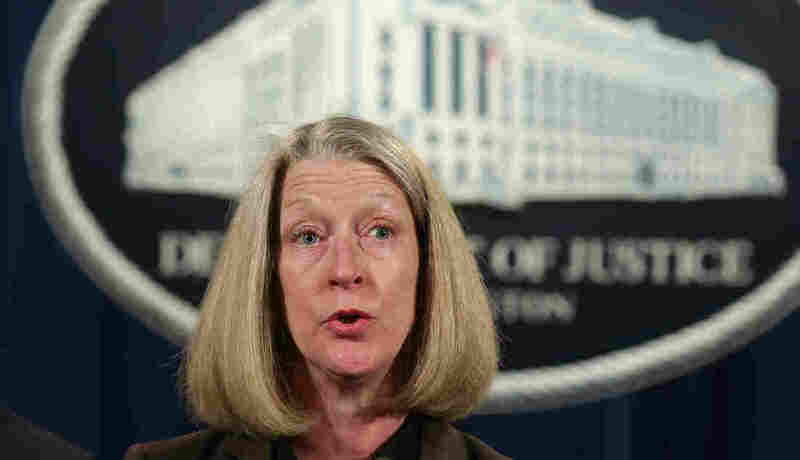 Acting Assistant Attorney General Mary McCord speaks during a news conference at the Justice Department on March 15. McCord told staff members she will be leaving next month. Her exit leaves a huge vacancy at one of the Justice Department's most important divisions, at a time when the Trump administration is struggling to fill the ranks. Attorney General Jeff Sessions is the only leader so far in the building to have secured Senate confirmation. His picks for deputy and associate attorney general await votes by the full Senate. The administration has not yet announced political appointees for other top posts. Protecting national security is the top Justice Department priority no matter which political party is in power. The National Security Division, created after the terror attacks on September 11, 2001, has filed criminal charges against Chinese and Russian hackers, sent Americans inspired by the Islamic State and al-Qaida to serve decades in prison and launched counterintelligence probes involving suspected spies. The investigation into Russian election meddling is one of the highest profile matters in the division's short history. It's not clear whether the probe will result in criminal charges against anyone. But both the Justice Department and the FBI are taking it seriously. Last month, FBI Director James Comey told Congress his investigators are looking into "the nature of any links between individuals associated with the Trump campaign and the Russian government and whether there was any coordination between the campaign and Russia's efforts." He added: "As with any counterintelligence investigation, this will also include an assessment of whether any crimes were committed."